The third millennium brought a lot of changes in the world, starting with the way people perceive what is around them, the expectations they have from the things and technology they use, the people they meet or the environment with which they come into contact at different points in their lives. The church is the pole of a community, people go there with faith and joy, knowing that they will find guidance in a warm and welcoming place. But ministries must also keep up with the rapidly changing needs of the parishioners and adapt to the modernizations taking place in all areas of activity. Therefore, churches must embrace the new technologies and discover how these can help pastors improve their duties and make church members and visitors feel more connected with the church. A constant concert of every pastor or church leader is to make sermons more engaging and captivating. Not only the words are important in a service, but also the way in which they are presented to the audience. A good presentation leads to a better understanding of the message the church leader wants to forward to his parishioners. Nowadays, making sermons more absorbing is easy using the numerous software applications designed especially for this purpose. Worship and presentation programs are special types of church software applications designed for displaying song lyrics with a matching image in the background during a worship session. 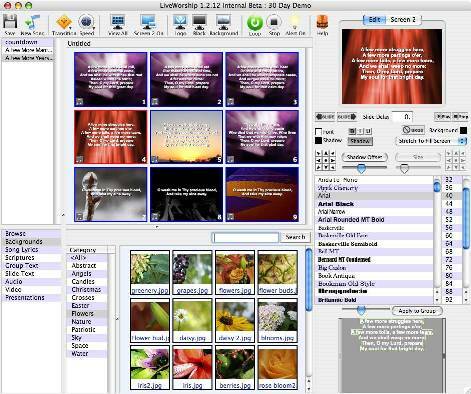 Worship software can be used by pastors during a service as a support tool, by accompanying their preach with pictures and texts from the Bible. However, the main use for this type of software is congregational singing, so that the all parishioners easily see the lyrics displaying on the song’s cadence. At the beginning, overhead projectors were used to display the lyrics but now video projectors are preferred because of their continuously increasing performance at more and more convenient price. When people realized what an improvement would be to also have the application produce images for the display, programs like PowerPoint were quickly employed. However, such general-purpose presentation programs have severe limitations, for instance when displaying lyrics for a large number of songs. To overcome this downside, special worship programs were developed. These new solutions have a large database for storing the song lyrics and easily retrieving them when they need to be projected. The database will keep the songs well organized; they can be sorted or grouped according to their type or any other criteria. There can also be records for copyright authorization. As said earlier, most presentation programs display not only lyrics, but also texts from the Bible, often translated in more than two languages. The programs are sometimes considered a complex extension of PowerPoint, they can display PowerPoint slides with text, graphics and audio or video as background. Also, they provide means for playing DVDs and live show videos from a camera, a feature that comes in handy for viewing special events that take place within the community along with everyone gathered in the church. Some applications include special features for planning the service or scheduling participants to the sermon. These worship software programs are used either directly by church leaders during a service or, and this is usually the case with large churches, by a computer operator that is in charge of what is projected. An interesting worship program is LiveWorship. The software has a simple and intuitive graphic interface, which makes it easy to use even for the ones with limited computer skills, and a large, powerful database for storing a large number of songs, lyrics, Bible texts, videos and even already-made presentations. It is recommended that users perform regular backups in the media library folder to assure that no information is lost and that any changes are up-to-date. The great thing about this application is that it is cross-platform, so it can be used on any operating system. Whether you are a Windows or a Mac user, the interface looks the same. Creating presentations is very simple. Users just have to drag and drop the different categories from the Media Library displayed in the left corner to the Presentation Panel or Slide Group Panel in the right. The interface also provides a Preview and Slide Edit Panel to easily walk through the slides and make changes to the presentation while working on it. The software has a set of pre-loaded songs in the database which can be imported into the Media Library and used directly into the presentations. You can download a 30-day free trial of LiveWorship with no functionality restrictions from http://www.liveworship.com/downloads/index.html. If you want to review more worship and presentation software products, please visit our page easy-worship-church-software-makes-sermons-a-breeze.htm . If you are interested only in free worship solution, take a look at our article compare-free-church-software.htm.